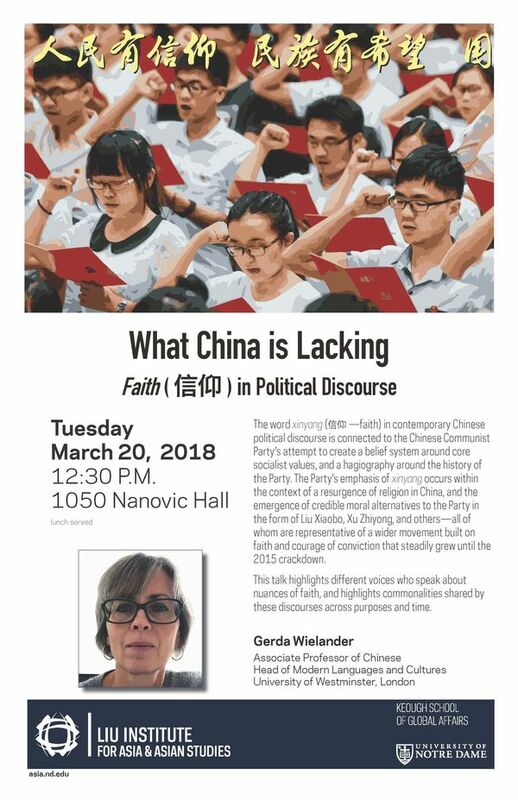 Lecture: "What China is Lacking — Faith (xinyang) in Political Discourse"
This talk focuses on the appearance of the word xinyang (faith) in contemporary Chinese political discourse. It analyses the Chinese Communist party’s attempts to create a belief system around socialist core values and a hagiography around the history of the Communist party and its saints. It places the party’s emphasis of xinyang in the context of the resurgence of religion in 21st century China and the emergence of a credible moral alternative to the party in the form of Liu Xiaobo and citizen lawyers like Xu Zhiyong - representative of a wider movement built on faith and courage of conviction, which gained traction and support until the party’s crackdown from 2015 onwards. Rather than juxtaposing certain types of discourse on faith, the talk will showcase a variety of different voices who speak about faith in different nuances in the second decade of 21st century China, thereby highlighting the way hegemonic discourse is created in China, what common points the different discourses share and the ways they tie in with earlier discourses on faith and values in Republican China. Gerda Wielander is associate professor in Chinese and Head of Modern Languages and Cultures at the University of Westminster, London. Her main research interest lies in the link of the personal and spiritual to wider social and political developments in modern and contemporary China. She is the author of Christian Values in Communist China (Routledge 2013) as well as several book chapters and articles in leading peer reviewed journals. Her most recent work includes an edited volume on Chinese Discourses on Happiness (Hong Kong University Press 2018). She is currently working on spiritual language in Chinese political discourse, and the emergence and promotion of a Chinese cultural psychology. This lecture is free and open to the public. A light lunch will be served while supplies last.